Lake County Railroad GP-7 #1617 southbound along the shores of Goose Lake. Photo by Michael Johannessen and is used with permission. When the Southern Pacific announced plans to abandon their Lakeview branch in 1984, the Lake County government became concerned. Four forest product facilities formed Lakeview's economic base, and these industries were reliant on the continued operation of the railroad. The local leaders recommended two possible solutions, a per carload surcharge to fund improvements on the line or conveying the property to a shortline railroad for continued operations. The local leaders quickly discounted the surcharge option, and a search for potential shortline operators turned up no interested parties. SP filed an application with the Interstate Commerce Commission to abandon the branch in March 1985 after the initial local efforts stalled out. Lake County initially did not want to purchase the line, but as abandonment became more certain the county started evaluating options for placing the line into public ownership. The county identified three primary obstacles to county ownership; state laws prevented local governments from owning property outside the state, the county did not have the money to purchase the line, and the county did not want to operate the railroad themselves. The state legislature enacted a law permitting local governments to own railroads outside of the state, and then the Oregon State Lottery agreed to fund up to 85% of the purchase price if the county could find an operator. The county went to work, and the Great Western Railway, an established shortline based out of Colorado, agreed to operate the line on a contract basis. Things then moved quickly. The ICC granted SP permission to abandon the line in August 1985, but SP agreed to continue operations until the county's efforts to buy the line succeeded or failed. Shortly afterwards the county agreed to purchase the railroad for $550,000. The Oregon State Lottery granted the county $474,150, and the four forest products facilities in Lakeview contributed approximately $21,000 apiece. Lake County took possession of the line on 18 January 1986. Great Western Railway set up their N-C-O division to handle operations, and they had two of their locomotives on the property at the start of operations. The county held a dedication ceremony in Lakeview on the morning of the 18th, with various dignitaries and officials giving speaches from a flatcar posed between the two Great Western locomotives. The county held a naming contest to generate interest in the railroad in the months before the purchase, with "Goose Lake 55" selected as the winning entry, as it reflected both the geographic location and length of the new railroad. The county and Great Western Railway then got down to the business of running a railroad. SP had deferred maintenance on the line for many years, and by the time the county took over the physical plant was in poor shape. 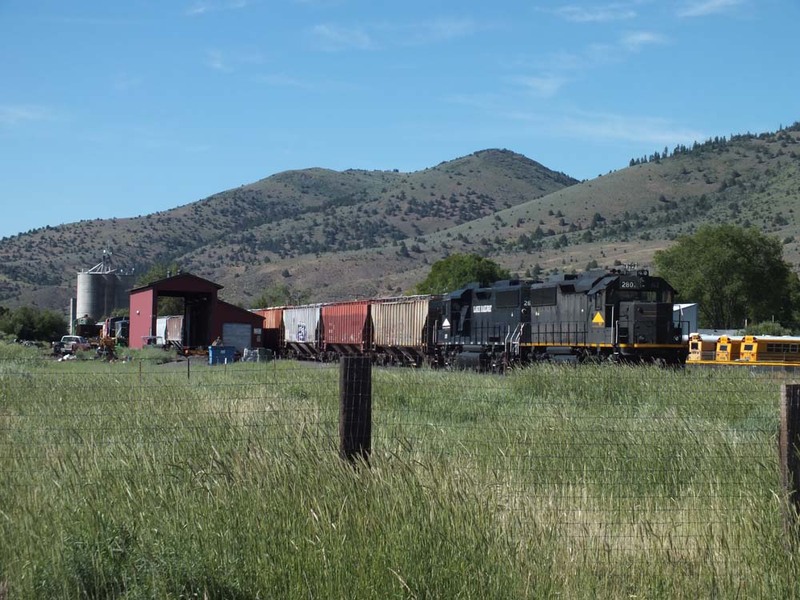 The county secured additional grants to fund various improvements such as track rehabilitation, constructing an enginehouse/shop building in Lakeview, and installing short spurs at Davis Creek and Willow Ranch. Great Western ran two trains a week over the line to keep the flow of loads and empties going. However, freight traffic continued to drop, mostly due to the on-going recession in the timber industry during that time. Four forest product facilities operated in Lakevew when the county took over; by 1990 this number was down to three, with a further reduction to two by early 1991. The railroad tried to generate loads from other sources, including a couple carloads of lumber trucked south from the huge Snow Mountain Pine mill in Burns. Great Western grew unhappy with the line but continued operations. Lakeview and Lake County desperately needed the railroad to keep what little industry it had left, and as early as 1989 the county contemplated taking over direct operations. However, the arrangement with Great Western lasted until December 1996, when the operating contract ended and Great Western Railway pulled out. Lake County set up the Lake County Railroad to take over direct operations. Lake County purchased one of the locomotives that Great Western Railway used on the line, but had trouble purchasing other equipment from the former operator. Lake County Railroad caboose #1015, an ex-SP car still lettered for the Great Western, sitting in Lakeview next to the railroad's shop building. Photo by and courtesy of John Barnhill. Lake County's timing could hardly have been worse. One of the remaining sawmills soon closed, leaving Fremont Sawmills as the only remaining shipper. To compound problems the railroad immediately experienced extreme difficulties obtaining empty cars from Union Pacific, who completed its purchase of the Southern Pacific on 11 September 1996. Service over the line dropped to once a week or less. The railroad's only locomotive developed serious health problems, which required the company to lease one of Great Western's locomotives still on the property for a while until a suitable used locomotive could be found and purchased. The county soon came to a critical point with their railroad. Tight car supply kept shipments from the Fremont mill at next to nothing, and the railroad was losing money at an alarming rate. The county did not have the resources to subsidize operations, and some in the government advocated shutting the line down and liquidating its assets. However, at literally the last minute a savior arrived on the scene in the form of a Perlite mine located in northern Lake County, near the small community of Paisley. The perlite mine had been trying to start operations for a few years, and they finally got the leadership and financial backing to go into full scale production in late 1998/early 1999. The Lake County Railroad was on the verge of closing when the first Perlite loads moved, and the new traffic literally saved the railroad. The Perlite traffic allowed the Lake County Railroad to be placed on a firm financial footing. 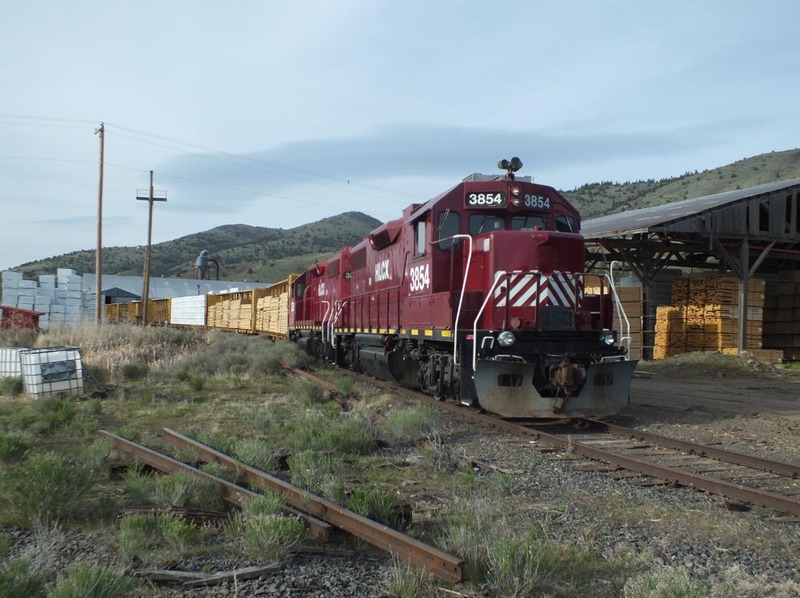 The railroad made many improvements through the property, with the biggest involving replacing several miles of rail with heavier steel salvaged from the abandoned portion of SP's Modoc Line south of Alturas. However, the heavy perlite loads started to beat up the tracks and equipment pretty bad, which led to a rash of derailments starting in late 2005. 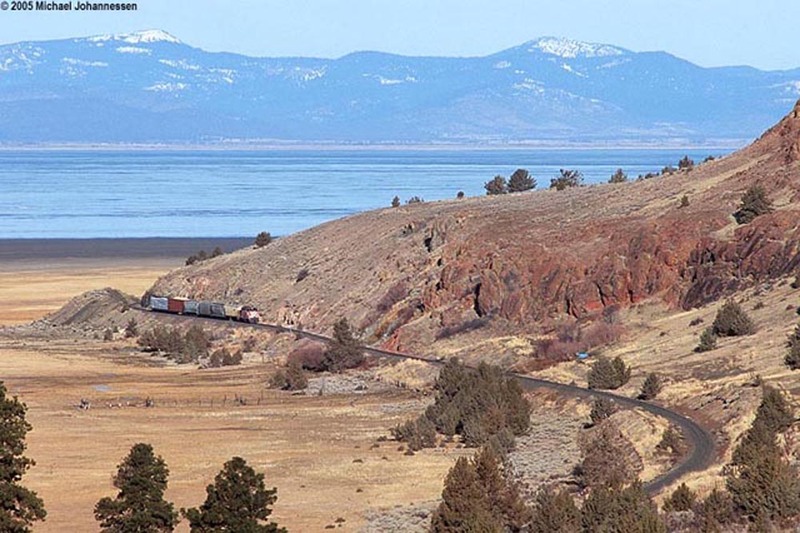 By the spring of 2006 the Lake County Railroad was using the technical expertise and some equipment provided by the Modoc Northern Railroad, who took over the Klamath Falls-Alturas trackage from Union Pacific in November 2005. The dealings eventually prompted Lake County to lease their railroad to the Modoc Northern for continued operations. The Modoc Northern inherited one of the two locomotives with the lease. Modoc Northern lasted until May 2009, when Union Pacific cancelled its lease of the Klamath Falls to Alturas trackage. Shortly afterwards Lake County terminated MN's lease of the Lake County Railroad. A Lake Railway train awaiting departure from Lakeview in June 2016. Jeff Moore photo. 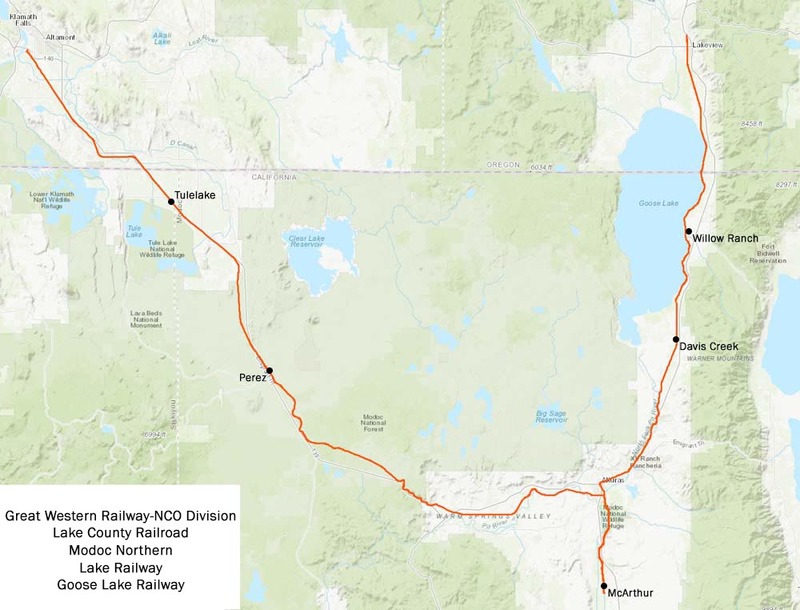 Lake County immediately hired Frontier Rail, a shortline holding company with operations scattered across the nation, to replace the Modoc Northern. Frontier set up the Lake Railway (LRY) to handle operations. LRY expanded in December 2009 when it leased the part of the old SP Modoc Line from MacArthur north through Alturas to Perez from Union Pacific. The new operation got an immediate boost in the summer of 2010 when Lakeview became a construction base for Ruby Pipeline, a natural gas pipeline constructed from Wyoming to Oregon. Lakeview became a construction base for the pipeline, and the railroad handled many carloads of pipe into town. The revenues from that allowed LRY to invest in improving the railroad. The improvement work continued through at least 2014, with some of the later work financed by Connect Oregon transportation grants. However, by 2016 the two shippers in Lakeview experienced growing frustrations with LRY's service and pricing and launched a campaign to get Frontier removed from the property. These efforts resulted in Lake County cancelling its operating contract with Frontier in the middle months of 2017. Frontier in response filed a Federal lawsuit and initiated action before the Surface Transportation Board seeking to block their removal from the line. The litigation lasted through the summer of 2017 before the parties reached arrangements under which Frontier agreed to continue operations until the county could find a new operator. The temporary pause in the litigation allowed the county to once again start looking for a new lessee. Several established rail operators looked at the line and submitted proposals, but in the end the county chose Goose Lake Railway, a new company under the same ownership and management as Cornerstone Industrial Minerals, owner and operator of the perlite mine. Goose Lake Railway (reporting marks GOOS) commenced operations on the Alturas to Lakeview line in September 2017, while Lake Railway retreated to just the Alturas to Perez trackage. The situation only lasted for several weeks, as in mid-October Frontier vacated that line and turned the Unon Pacific lease over to Goose Lake as well. Goose Lake Railway switching in Lakeview. Jeff Moore photo. At present, Goose Lake Railway provides service on the Lakeview-Alturas-Perez trackage, interchanging with the Union Pacific at Perez. Traffic is still perlite from Cornerstone Minerals and lumber and woodchips from the Freemont sawmill. Goose Lake is in discussions with other potential shippers as well. In the meantime, Frontier's lawsuit against Lake County and other parties is slowly progressing and is scheduled to go to trial in the fall of 2018. The Perlite reload in Lakeview. Photo by and courtesy of Fred Harrison. #1589- EMD GP-7, 1500 horsepower, c/n 14697, blt 1951. Originally Chicago, Burlington & Quincy #233; to Burlington Northern #1589; to Great Western Railroad #1589. Transferred to N-C-O division 1986. Disposition unknown, but likely off the roster early 1990s. #1617- EMD GP-7, 1500 horsepower, c/n 18977, blt 1953. Originally Chicago, Burlington & Quincy #261; to Burlington Northern #1617; to Great Western. Transferred to N-C-O Division 1986; sold to Lake County Railroad 1996. #1621- EMD GP-7, 1500 horsepower, c/n 19604, blt 1953. Originally Chicago, Burlington & Quincy #265; to Burlington Northern #1621; to Great Western Railroad #1621. Disposition unknown. #3416- EMD GP-9, 1750 horsepower, c/n 21334, blt 1956. Originally Southern Pacific #5641, then SP #3474, then SP #3416; to Great Western Railroad #3416. Leased to Lake County Railroad for at least the first several months of their operations. Disposition unknown. #700- EMD GP-7, 1500 horsepower, c/n 18604, blt 1953. Originally Nickel Plate Road #436; to Norfolk & Western #2436; to Weyerhaeuser Timber Corp. #776; to Chehalis Western #776; to Columbia & Cowlitz #700; to Lake County Railroad #700. Included in lease to Modoc Northern in late 2006. 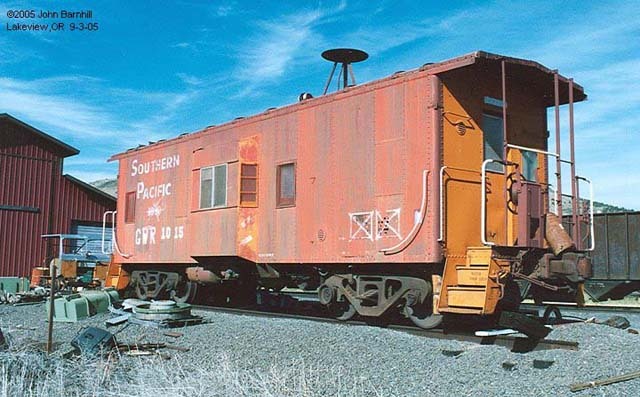 Locomotive suffered a severe mechanical failure on Modoc Northern and was placed in storage at Tule Lake with MN's other power following the demise of that road. Locomotive returned to Lake County and moved back to Lakeview, OR, where Frontier restored it to operation for use on Lake Railway. #1617- EMD GP-7, 1500 horsepower, c/n 18977, blt 1953. Originally Chicago, Burlington & Quincy #261; to Burlington Northern #1617; to Great Western. Transferred to N-C-O Division 1986; sold to Lake County Railroad 1996. To Western Rail 2005. #1761- EMD GP-9, 1750 horsepower, c/n 19110, blt 1954. Originally Union Pacific #261; to Morrison-Knudson for re-manufacturing Feb. 1980; to Kyle Railways #101; to San Diego & Arizona Eastern #101; to San Joaquin Valley Railroad #101; to Western Rail Incorporated (WRIX); to Lake County 10/2005; returned to Western Rail in late 2008. #4263- General Electric B23-7, horsepower, blt 1985. Originally ATSF #6406; to BNSF #4263; to NREX #4263 on 20 July 2007. 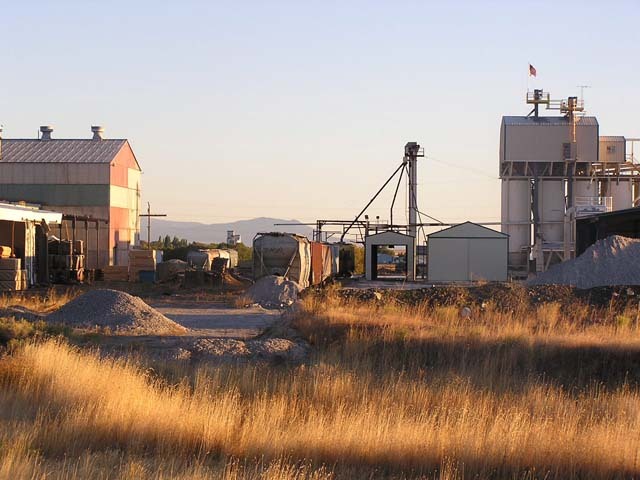 Leased to Cornerstone Industrial Minerals, Lakeview, Oregon, in December 2008; subsequently leased to Lake Railway. Locomotive returned to NREX in late February 2010 and sent to Council Bluffs, Iowa. #2802- EMD GP49, c/n 837049-2, 2950 horsepower, blt 1983. Built as Alaska Railroad #2802; to National Railway Equipment; leased to Frontier Rail and moved to Lake Railway spring/summer 2014. Transferred to other Frontier operations fall 2017. #2809- EMD GP49, c/n 84703-5, 2950 horsepower, blt 1985. Built as Alaska Railroad #2809; sold 2008 to National Railway Equipment; leased to Frontier Rail and moved to Lake Railway in December 2009. Transferred to other Frontier operations fall 2017. #1259, 1270, 4001, 4031- Baldwin RS-4-TC, all originally built for U.S. Military and brought to Alturas by early 2000s for a proposed railroad museum. Acquired by a private party, who leased them to Frontier in exchange for shop work. All transferred to other Frontier operations fall 2017. The Lake Railway also used the former Lake County/Modoc Northern #700, and gained title to the machine through the shop work. Transferred to other Frontier operations in the fall of 2017. #2422- EMD GP-30u, 2250 horsepower, c/n 27209, blt 6/1962. Originally Atchison, Topeka & Santa Fe (ATSF) GP-30 #1222, then #3222; rebuilt to GP-30u #2722 6/1983; to BNSF #2422 3/2000; to Southwestern Railroad #2422 sometime after 2005. Leased to GOOS upon startup of operations. Returned to lessor in the early months of 2018. #3847- EMD GP38-2, 2000 horsepower, c/n 72604-2, blt 10/1972. Originally Louisville & Nashville #4091; to Seaboard System #4091, then #2601; to CSX #2601; to Helm Leasing #2601 1993; to Southern Pacific #170, then #4865; to Union Pacific #1990, then #493; to Helm Leasing #3847 2 June 2008. Leased to Goose Lake Railway, arrived December 2017. #3852- EMD GP38-2, 2000 horsepower, c/n 72704-16, blt 9/1972. Originally Louisville & Nashville #4085; to Seaboard System #4085, then #2595; to CSX #2595; to Helm Leasing #2595 1993; to Southern Pacific #165, then #4860; to Union Pacific #486; to Helm Leasing #3852 4 November 2005. Leased to Goose Lake Railway, arrived November 2017. #3854- EMD GP38-2, 2000 horsepower, c/n 72704-20, blt 9/1972. Originally Louisville & Nashville #4089; to Seaboard System #4089, then #2599; to CSX #2599; to Helm Leasing #2599 1993; to Southern Pacific #4863; to Union Pacific #489; to Helm Leasing #3854 1 January 2006. Leased to Goose Lake Railway, arrived November 2017. "Tough Times in Timber Country" by Greg Brown, Nov. 1990 Pacific RailNews: pgs 24-34. "The Short Line Connection" by Shirly Johnson, Jan/Feb 1991 Southern Pacific Bulletin: pgs 10-15. Western Shortline Rosters page for Great Western Railway-NCO Division. Western Shortline Rosters page for Lake County Railroad.